Hey Honey, how are you doing down South? After having been out of the country for two months and with only three hours of sleep and a very empty stomach, I headed into Honey's Sit n' Eat on South Street for some good old fashion American brunch. Unlike the Honey's in Northern Liberties, this Honey's had no wait. It was 9AM on a Saturday and we got seated immediately. Also unlike its counterpart in Northern Liberties is the spacious feeling of the establishment. Sunlight permeated the dining area, morning chatter filled up the room, and the smell of coffee aroused my senses. We both got the Honey Cristo - mine had French toasts stuffed with ham and Swiss cheese. 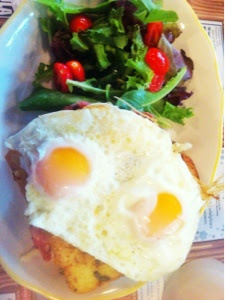 With the gloomy weather outside, the sunny side eggs that lied in top of the plate was deliciously wonderful. 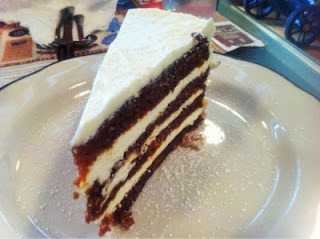 We were undecided about dessert, but the waiter swore by the carrot cake. So, we split it. When the slice of heaven came, I was secretly hoping that my foodie mate wasn't that hungry anymore, because one bite of it made me want not just the slice, but the whole pie. Altogether, my experience here was much better than the one in Northern Liberties. The wait was nonexistent (for us), the atmosphere was relaxing, and the food was what American comfort food is all about.